GENERON, a leader in the design and supply of nitrogen generators, membrane and pressure swing adsorption systems, and their Distributor, Air Capital Equipment of Wichita KS is pleased to announce a Twin Tower PSA system has been delivered to AeroFlex of Wichita. 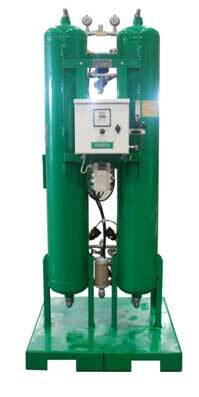 The generator will provide nitrogen to their product soldering application. The system was designed to deliver 99.999% pure nitrogen at flow rate of 172 SCFH and includes, Oxygen analyzer and Activated Carbon system. GENERON and its U.S. distribution network are available to assist you with Primary Air Compression, Instrument Air Systems and Nitrogen Generators for your specific application. Please contact us with your requirements. For further information on the GENERON group of companies and our capabilities, visit www.generon.com.